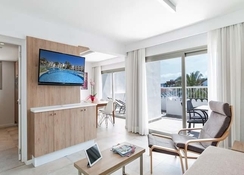 Around 300 metres from the beach in Palmanova and 400 metres from the Palma de Majorca city centre, Ca’s Saboners Aparthotel is a modern holiday resort in the Balearic Islands. 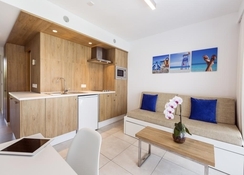 This family-friendly aparthotel features spacious, comfortable apartments and studios well-appointed with terraces, kitchenette, fridge, toaster, kettle, microwave, television and air conditioning. Developed in a Mediterranean style with all modern comforts, the resort boasts an attractive central pool area surrounded by palm and olive trees in a verdant garden landscape. Ca’s Saboners Aparthotel houses a grand onsite restaurant and bar, but also facilitates an alfresco meal on your apartment terrace while soaking in the amazing views. The hotel is a perfect leisure and entertainment hub with a swimming pool, playground, entertainment shows, snack bar and separate facilities for kids and young guests including babysitting facilities. Those who love shopping can indulge in some retail therapy at La Vila Shopping Centre, just a five minutes’ walk from the hotel. Ca’s Saboners Aparthotel is located at a comfortable walking distance from the beach. Slightly away from the hustle and bustle of the city centre, the hotel is just 17 km from the nearest airport in Palma de Mallorca. It hardly takes around 10 minutes to reach the hotel from the airport. 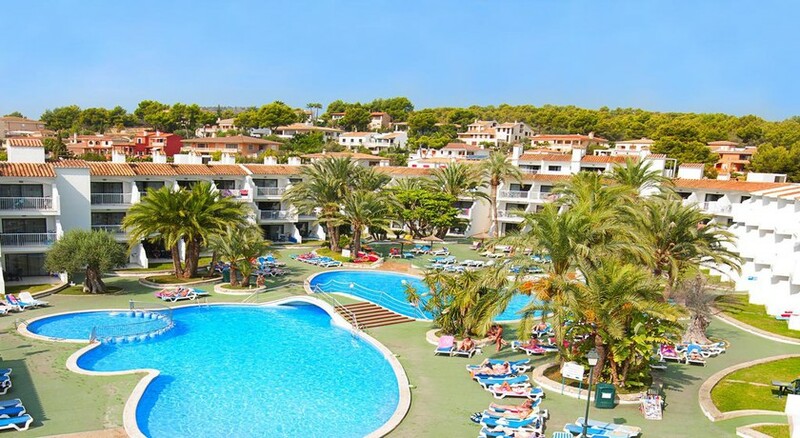 The Palma de Majorca town is around 10 minutes from the hotel. The hotel accommodates its guests into various types of apartments and suites: Superior Apartment, Premium Apartment – Ground Floor, Family apartment and Suite Heaven. 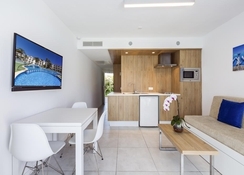 In soothing colours and wood décor, these disabled-friendly apartments feature private terrace/balconies, spacious living rooms with sofa bed and a functional kitchenette. The apartments are well equipped with modern amenities like satellite TV, telephone, fridge, microwave, baby cots, air conditioning and Wi-Fi. The apartments come with well-equipped kitchenettes, so you can prepare your own food. There’s also a mini market from where you can get your daily supplies. Those who like to dine out, the hotel features an on-site restaurant and a snack bar with a wide selection of dishes. The aparthotel entertains its guests with a range of leisure and recreational amenities, including outdoor swimming pool, sun beds, playground, bicycle rental, entertainment shows and board games like billiards. Young guests have got a children’s playground, kids’ park and water slides. There’s also a shopping centre, very close to the hotel. you can also explore Palma de Majorca, which is around a 10-minute walk away.